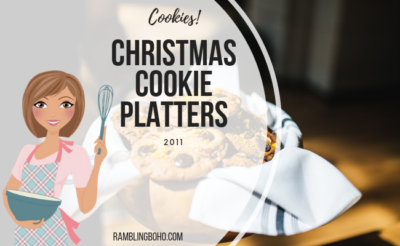 Did you receive a Christmas cookie platter or goodie bag? Interested in knowing what the heck all those treats are in them? Well, here ya go! I decided the best thing to do was to list all the recipes I used for my treats so that the recipients can see exactly what’s in the cookies, and they can make them for their family if they like them. Hope you enjoyed the gift! I sure did enjoy making it! All recipes (not mixes) were made with unbleached flour, real butter, fresh eggs from my own chickens, kosher salt, pure vanilla extract, and flavored oils. This is a huge recipe. I halved it, and it still made alot! I used red & green sprinkles for Christmas cheer. You can find the recipe here. Mine didn’t turn out like the picture. They spread alot. But they still taste yummy! Some of my cookies have snickers, some have three musketeers, and some have milky ways inside. Anyway you have it, it’s chocolicious! You can find the recipe here, from Taste of Home recipe books. These are a nice, light, crispy sugar cookie with the added flavor & color of maraschino cherries. I’m not a fan of sugar cookies, but my son sure enjoyed eating all the broken ones! You can find the recipe here, from Taste of Home recipe magazine. I will admit I cheated here. I had a box of this laying around, and decided to try them out. I made them as the package states, and didn’t use any of the variations. Quite easy. These were an easy way of making ‘cut-outs. I am too lazy to roll out dough, and use cookie cutters, so I tried this. So much easier, and they turned out just as cute! You can find the recipe here, from Taste of Home magazine. From the Taste of Home magazine. Been making these for a few years. They are quite addicting, cute, and not too hard to make. You can find the recipe here. Oh my goodness, these things are to die for! So, so good. This is the first year I made these, and I’m so happy I did! You can find the recipe here, at All Recipes. This stuff is just so good. You do have to make sure your candy thermometer is working correctly, and that your toffee reaches the soft crack stage. Mine was just under because I was bad, and didn’t test my thermometer before cooking. But it still came out yummy. Just like the stuff you pay $15 a pound for. Here is the recipe if you want to give it a shot. I know. Fruitcake. Blech. But really, these are good. Honestly. They have a nice rum flavor, the candied fruit aren’t too intense, and their moist. If you’d like to try the recipe, you can find it here. Mincemeat. 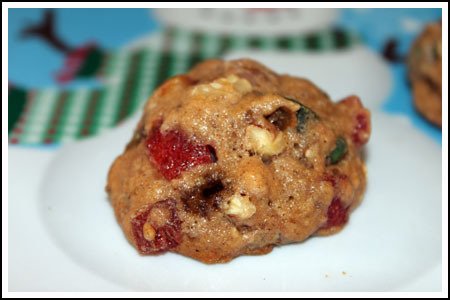 The yummy pie filling made with apples and raisins work well in this cookie. Moist & flavorful. Very addicting. You can find the recipe here, on All Recipes. I’ve been making these every Christmas for about four years. I usually make two batches, but this year, I couldn’t just run out to the store to grab another box of nilla wafers, so I could only make one batch. These get much better the longer they sit. Give them a week or two to soak in the flavor. You can find the recipe here, at Recipezaar. Here’s another one where I cheated. I used a mix. Yep. But, I gotta tell ya, these taste really chewy & chocolaty I really like them…even though they are a mix. I couldn’t find an online recipe for this one. It comes out of Favorite Brand Name 100 Best Holiday Cookies cookbook. I will try to put up the recipe soon. I love this book. A great find at the thrift store!